I have a Windows 7 PC at home that runs some scripts at night to perform backups and do some other stuff on my network. I have gone into my power settings and made sure that the compute never turns off and that it doesn’t go to sleep or hibernate. However, there are still times when the computer will restart because of some Windows Update, etc. This had become very annoying and I didn’t have the time to spend trying to reconfigure settings or figure out how to prevent Windows from restarting, shutting down or sleeping. Instead, I just downloaded a nice little program that does all that for me. 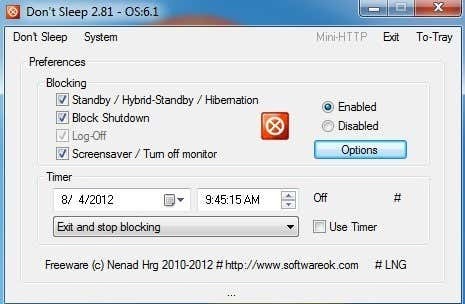 Don’t Sleep is a free Windows utility that will block/prevent Windows from sleeping or restarting or shutting down. The nice thing is that it’s a super small file and it doesn’t even have to be installed onto your system, you can just run the EXE file. Once you download it, unzip the file and run DontSleep.exe. Under Blocking, you can check several boxes. You can prevent the PC from going into Standby/ Hybrid-Standby / Hibernation. 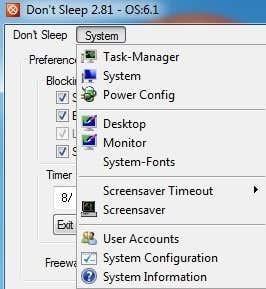 You can prevent the computer from shutting down and you can prevent the screensaver from turning on or prevent Windows from turning off the monitor. By default, it prevents the user from logging off too because otherwise it would not be able to prevent a shutdown or restart. You can just click on the Exit button at the top right if you wanted to log off. The program also has a timer at the bottom, so you can check the Use Timer box and then choose a date and time to Exit and either stop blocking or shutdown or restart, etc. So if you only want to prevent shutdown for a specified period of time, you can do so using the timer feature. If you click on the Options button, you’ll see more options for how and when to run the program. Here you can choose to start Don’t Sleep when Windows starts, start it minimized to the tray, the time after coming back from standby that the program should start, etc. Lastly, if you click on System at the top, it has a bunch of shortcuts to various system settings like Task Manager, Power Options, Screensaver, etc. Overall, the program is very easy to use and does a good job of actually preventing your PC from turning off, restarting or going to sleep. If you’re looking for a good program to do this, Don’t Sleep is really nice.